Flâneur, (n.) A loafer, idler. From the Fr. flâner (v.), ‘to stroll, saunter’. “The phrase is flaneur,” I cut back, “it simply means we have to saunter the streets of the city as if we’re on show…” I followed her into the bedroom, “particularly where we’re going, it’s glamour personified.” She pulled open the wardrobe, revealing a clothes rack sagging under the weight of apparel, “but I have nothing to wear!” she bleated. Not four hours later, after an effortless glide on the Eurostar we were turning off the bustling ringroad of the Bastille and into the quiet, narrow streets of Le Marais. One of Paris’s oldest districts, it’s as close as you might be able to get to the pre-Hausmann city. Central to the area is Le Place des Vosges, perhaps the grandest of Paris’s residential squares and the spiritual home of flâneurisme. Steeped in history, being the site of the former residence of King Charles V, we arrived with it bathed in a delicate pink from the afternoon sun. This was our destination, and tucked under the cloisters that surround the square, among countless art galleries and the occasional cafe, was the entrance to Le Pavillon de la Reine, our hotel. We approached it gracefully, noses aloft; and with the rattling of our bags’ wheels on the cobbles announcing our arrival. In the lobby, mighty beams in the low ceiling and the imposing heft of broad, squared columns and polished flagstones lend an almost medieval ambience. There are few frills here, but they are not necessary. There’s an old school conduciveness through this fuss-free hotel that even extends to the ‘honesty’ bar in the lounge. One would feel it an imposition to be fussed over. Make yourself at home, it says. And homely it is. Every inch of wall is covered in patterned, embroidered cloth, even the frame of the mirror in the tiny lift is wrapped in the same burnt orange velvet at the walls. The narrow hallways, illuminated by low-hanging, down-facing lamps, their light absorbed by the dark decor, give the route to one’s room a claustrophobic air, but it’s not forbidding or daunting, more cosy. 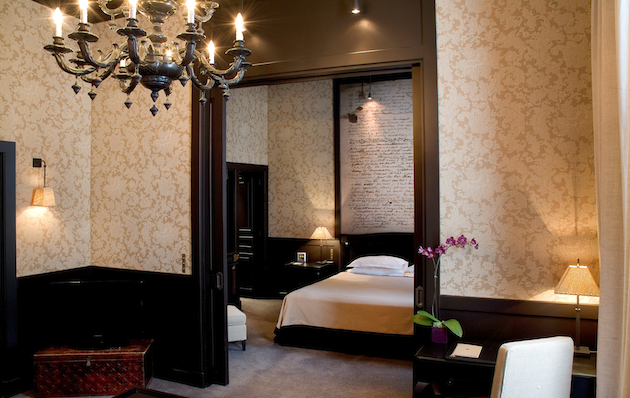 Lush, swaddling soft furnishings adorn the rooms, culminating in the most luxurious of king-size beds – fit for a queen. There is a spa, but it feels like a token offering in an effort to compete with the corpulent multinationals that have emerged in the last decade. That afternoon, a solitary clinician met us as we descended the stairs to the basement into what as an attractive, if simple, sanctuary but, passing on a treatment, a spell in the capacious hammam was all that we craved. Such limited indulgences don’t even extend to a restaurant – there isn’t one – but, again, it’s not necessary. You simply wouldn’t wish to eat in your hotel when you have Paris on offer. 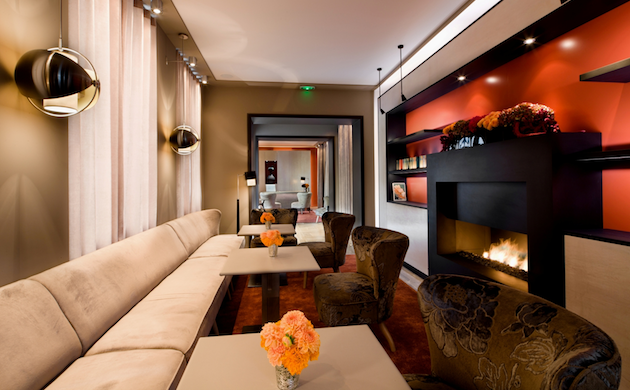 There is no restaurant in the hotel and wisely so because it sends you into the surrounding area, and the real ‘essence’ of the hotel is in its position in Le Marais, Paris’s Chelsea. While not the bohemian, cosy cobbled streets of Montmartre, Le Marais oozes Parisian charm. We set off for a saunter before supper, taking in the atmosphere, from passing beret’d bicyclists to schools spilling their children onto the streets at the end of the day, before posing in a suitably worn cafe with an indulgent chocolat chaude. It was all so wonderfully clichéd. All I was missing was a Gitane stuck to my lip and a necklace of onions. The latter doubtless doing nothing for my image. When one knows and loves a city but hasn’t visited for some time, there are things one craves, and dinner that evening was no exception. Behind La Reine, in a square no bigger than a courtyard, sits Chez Janou, a small, intimate bistro, recommended by the front desk – performing an exceptional job, I should add, in providing options for every mood. Here, in true French fashion, we were bundled to a tiny table in a corner to dine on steak-frites, succulent lamb and green beans and a carafe of vin rouge. Simple but sumptuous and just what we needed. From the intimate streets of Le Marais, the next day we moved to the broad boulevards of Hausmann’s Paris, accentuated by the massive Parthenon-inspired imposition of the Madeleine church and a stone’s throw from the Place de la Concorde. Tucked behind those imposing arterials that slice through the city, amid the five-storey high townhouses that make up the network of residential streets between them, one encounters the odd enclave every so often where these streets meet. 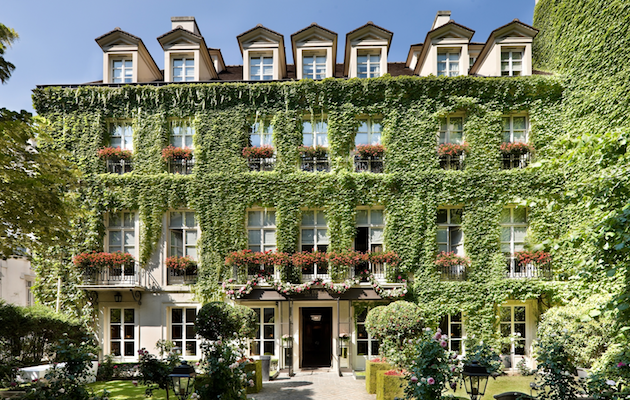 And just off one of these, Le Place des Saussaies, the sister hotel to La Reine, Le Pavillon des Lettres, occupies a corner of classic pale stone Parisian townhouses, complete with steep pitched roofs and ornate filigree balconies. From such a traditional Parisian exterior, with flourishes of art nouveau adorning the cornerpieces, I had expected a stuffy, dusty, rust bucket inside – its name and inspiration being a tribute to literature – but rather it is sleek, sophisticated and supremely comfortable. In fact, with the exception of its 26 suites being named after an A-Z of authors and the odd book on a shelf in its lounge, the only reminder that the literati was its inspiration is in our suite, where a nod to the room’s eponymous tributee is a section of a poem stencilled on the wall behind the bed and a copy of their greatest work on the bedside table. In French, naturally. I was excited to see who might be my inspiration. 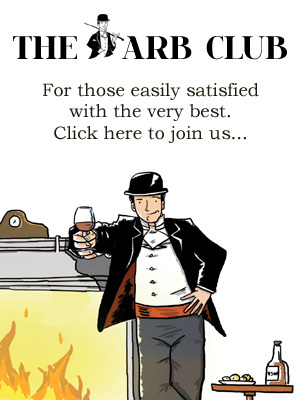 Flaubert, I wonder? Or Diderot? Or might they give me the token Englishman’s room, Shakespeare? “We’ve upgraded you,” the concierge had said. What luck, I thought. We must be in Hugo. He passed me the key, embossed with an ‘E’. E? Who is E? Eliot, perhaps. Or Emerson. I can’t think of many authors beginning with E. As we arrived on the fifth floor, at first I couldn’t make out the name on the door. “Is that Eschyle?” I asked Mrs L, bending to read the vertical lettering. I couldn’t disguise my ignorance, “Who is Eschyle?” A quote on the bathroom door, “Depuis la nuit dont sort le jour…” etched into the glass bathroom door left me none the wiser. 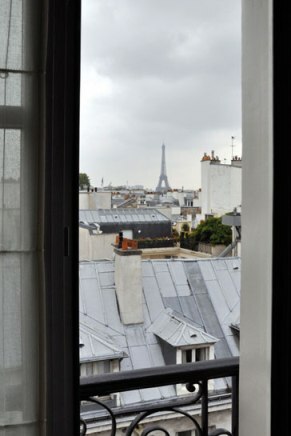 It mattered not, for my part being on the top floor of a Parisian townhouse, with low ceilings and windows that allow one to step onto the lead-lined balcony for views of rooftops across the city, it invoked all the romanticism of the tortured author I needed. And I had the best of both worlds. Here we were, in a room in a Parisian rooftop, the Eiffel Tower a glimpse away, and yet inside this was no ink-stained, roach-riddled bohemian apartment, this room was beautifully, delightfully, spankingly appointed. Smaller by far than the grandeur of La Reine, there was an intimacy to it, a crisp modernity in its design, pleasing to the eye and soft underfoot. As with La Reine, while there being little more on offer than a well-appointed room for the night, a hearty breakfast and basic bar, the hotel’s shortcomings are few. Any lack of restaurant is an asset, as one is but a recommendation from the concierge away, although the area, as you would expect, is pricey. And while tea ordered for the room does not automatically come with milk, I put this down to the idiosyncrasies of being English rather than a failing of the service. Isn’t that just me being fussy anyway? Again, its greatest asset is its location. We flanned a little more down the Rue de Saint-Honore, crossing the Seine and took an afternoon of art in the Musee d’Orsay before circling back to idle over the Pont Neuf. As we rounded back to the hotel, sashaying through the Tuileries, I mulled over the quote and tried to recall my schoolboy French, let alone the author. Finally up to Rue de Montorgeuil we sauntered for the finest patisserie in the land at the 18th century Cafe Storer. Our flans consumed, and flanning exhausted, it was back to the hotel. 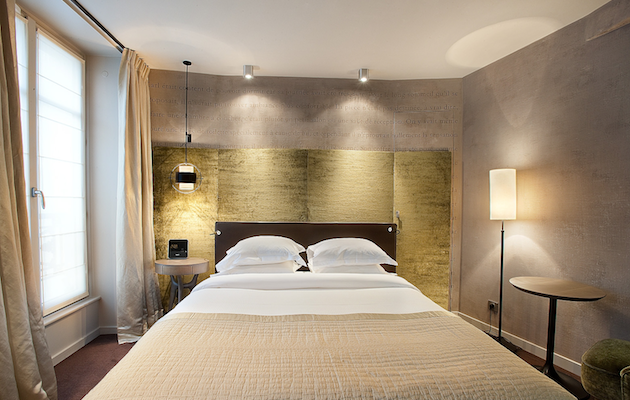 Two nights in Paris make up a delightful weekend of Bohemian, cultural titillation, mastering one’s ability to saunter and stroll; two days of which Les Pavillons provide the ideal respite and with an address that can support any posing that may be required. The only problem is deciding which to stay in. As we left, I noticed a table of Gainsbourg and Bardot look-a-likes sunning themselves outside. Here was my opportunity to blend in and be noticed. I deftly swept the door open, misjudged its weight, caught my bag as it closed and tripped headfirst into the bush that trims the pavement. It was the Greek dramatist, Aeschylus, and he said it perfectly on the bathroom door, “Since the night whose fate the day…”. I should have stayed in the hotel. 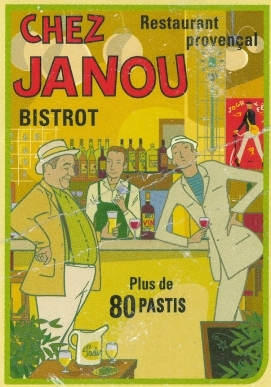 I love Chez Janou! Used to be my local. Still my go-to whenever I have guests visiting from out of town. Sounds like you missed the all-you-can-eat homemade chocolate mousse though – divine!